When working with HF, it is important to establish and continually review safety and emergency procedures. Below are suggestions to consider when defining policies that are most appropriate for your workplace. This is not an exhaustive list of best practices for all situations. Never use hydrofluoric acid when working alone or after hours. HF may be used when working alone during regular working hours provided personnel versed in first aid have been alerted and are in the general vicinity. All personnel, not just those who will be using hydrofluoric acid, should be informed of the dangers of this chemical and the emergency procedures necessary in case of an accident. All persons who will be using HF must be made aware of its properties and trained in proper procedures for use and disposal. Companies/Laboratories which keep or use HF gas or concentrated solutions (>1% hydrofluoric acid) should have these emergency procedures on hand as well as an MSDS. Students should never be given the task of mixing HF solutions. Only experienced persons familiar with its properties should handle the concentrated acid. 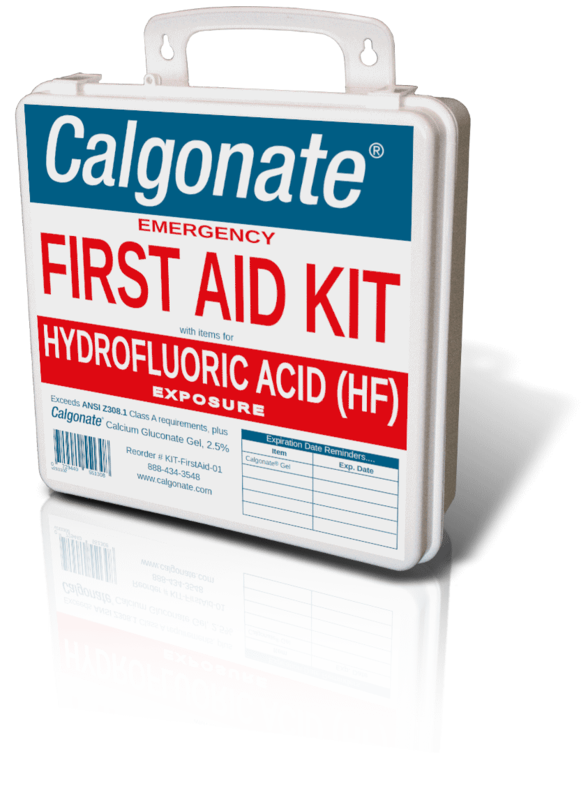 A commercial hydrofluoric acid spill kit is highly recommended for every HF facility. The kit should contain extra personal protection gear (gloves, goggles, shoe covers, etc.) spill containment, cleanup, and disposal items. A small supply of calcium carbonate or calcium hydroxide should also be kept near where the work will be conducted. If a small quantity (100 ml or less) of dilute HF solution is spilled, clean it up by using powdered calcium carbonate or calcium hydroxide. If a large amount is spilled, or if the HF is concentrated, contain the spill as much as possible, evacuate the area, and call 911. Avoid exposure to the vapors. Dispose of unwanted hydrofluoric acid. Wear goggles and a face shield. Wear a long-sleeved, buttoned lab coat, pants or long skirt, and closed-toe shoes. A chemical resistant apron is also recommended. Make sure to have tubes of Calgonate® Gel readily available in case HF comes into contact with any person’s skin. Any person exposed to HF must seek immediate medical assistance. In order to prevent cross contamination, the victim of hydrofluoric acid exposure should perform the following actions on him/herself. If the victim requires assistance, anyone present can do it... but they should be extremely careful not to contaminate themselves in the process. Any person assisting should use HF-protective gloves (Neoprene or Nitrile (22mil)) and other safety equipment. Do not use latex gloves; they do not provide an effective HF barrier. Immediately washing off the acid is a priority! There is a person that has been exposed to hydrofluoric acid. The person can be found at [give location of victim]. Rinsing may be limited to 5 minutes if Calgonate® Gel is available. If 2.5% calcium gluconate gel is not available, continue flushing with water for at least 15 minutes or until medical treatment is given. Apply Calgonate® Gel freely and massage it into the affected site. Apply the gel as soon as the washing is done. Affected area does not need to be dried prior to application. Note: Clinical experience has shown that 2.5% calcium gluconate gel is effective when used correctly in appropriate situations. After these actions have begun, the victim should be re-examined to ensure no exposure / burn sites have been overlooked. 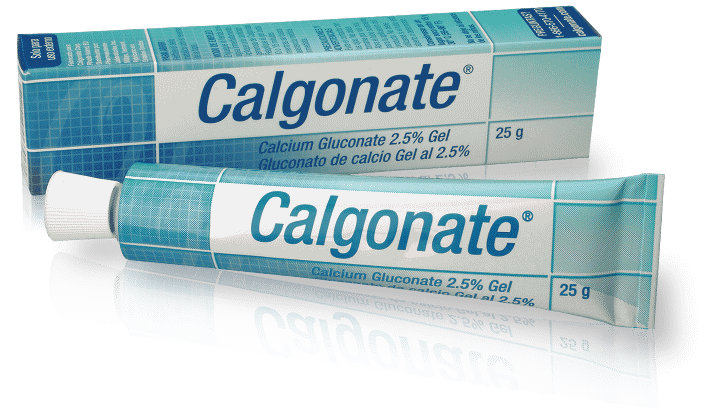 Calgonate® 2.5% Calcium Gluconate Gel should be reapplied continually every 10-15 minutes and massaged into the skin until the ambulance arrives or medical treatment is given by a physician or EMT. Take note of and provide the following information to the EMS team, and/or physician. The concentration of the Hydrofluoric Acid and its MSDS. Date and time of exposure, duration of exposure, and how it occurred. The time when Calgonate® Gel was first applied to the contaminated area, and how many times it was applied in total. Body parts affected or exposed, and the percent of body surface area affected. Summary of first aid measures given. Because HF penetrates deep into tissue, exposure of hydrofluoric acid solution or vapor to the eye can produce more extensive damage than other acids in similar concentrations. For example, hydrochloric acid damages the superficial structures of the eye, but its penetration is generally limited by a precipitated protein barrier. HF is not blocked by that same natural barrier. Immediate action is critical. Immediately flush eyes for at least 5 minutes with cool flowing water. Hold the eyelids open and away from the eye during irrigation to allow thorough flushing of the eyes. If sterile 1% calcium gluconate solution is available, washing may be limited to 5 minutes, after which the 1% calcium gluconate solution should be used repeatedly to irrigate the eye. Immediately take the victim to a doctor, preferably an eye specialist. Clean water, eyewash, 1% calcium gluconate solution, or ice water compresses should be used to continue to irrigate the eye(s) while transporting the victim. Immediately move the victim to fresh air and get medical attention. Keep victim warm, quiet, and comfortable. If breathing has stopped, begin CPR at once. Make sure mouth and throat are free of foreign material. 100% oxygen (10 to 12 L/min flow rate) should be administered as soon as possible by a trained individual. Continue oxygen while waiting for medical attention. A nebulized solution of 2.5% calcium gluconate may be administered with oxygen by inhalation. Do not give stimulants unless instructed to do so by a physician. The victim should be examined by a doctor and held for observation for at least 24 hours. The reason is that inhalation of HF fumes may cause swelling in the respiratory tract up to 24 hours after exposure. A person who has inhaled HF vapors may require prophylactic oxygen treatment. Vapor exposures can cause skin and mucous membrane burns as well as damage to pulmonary tissue. Vapor burns to the skin are treated the same way as liquid HF burns. Have the victim drink large amounts of water as quickly as possible to dilute the acid. Do not induce vomiting. Do not give emetics (vomit inducing agents) or baking soda. Drink several glasses of milk or several ounces of Milk of Magnesia, Mylanta, Maalox or similar product, or eat up to 30 Tums, Caltrate or other antacid tablet. The calcium or magnesium in these compounds may act as an antidote. Source: Segal, Eileen, B “First Aid for a Unique Acid, HF: A Sequel” Chemical Health and Safety, Jan/Feb 2000 vol. 7, #1, p18. Bronstein, A. C. and Currance, P. L. “Emergency Care for Hazardous Materials Exposures” Mosby Company 1988.